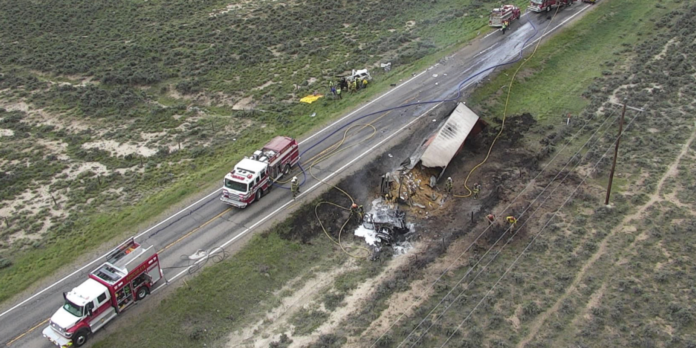 An aerial view of the semi crash from May 30. First responders were able to contain the blaze from the collision before it spread. Respond to Highway 40 in the area of Wolford reservoir for a head-on accident with major injuries; semi vs. SUV; semi is on fire. While we, as the fire service, endeavor to treat every dispatch with professionalism and urgency that is appropriate for life-threatening situations, not all emergencies are created equal. For example, certain keywords in this dispatch created the firm sense that we were about to face a rapidly changing, high-risk incident with a significant potential for growth. Such an incident requires quick response, effective action, and -above all else – trained firefighters. I walked into the bay at the fire station knowing that most, if not all, of Kremmling’s volunteer firefighters were working their day jobs. Moreover, many of our members work out of town, which often means we have a very limited crew on weekdays. As I looked up at the real-time response screen on the wall, I was thinking, “Are we going to get anyone midday on Wednesday?” A few names were already on the list showing their status as unavailable. However, two names popped up stating that they would be at the fire station in less than five minutes: Annie Sperandio and Aron Melendez. With a total of four personnel, we were able to staff two apparatus and respond within eight minutes of receiving the dispatch. We maneuvered the fire trucks around stopped traffic as I watched thick black smoke rising behind the hill. Our crew approached an accident scene that covered an area roughly the size of a football field. Plastic, glass, and metal fragments were strewn uniformly over both lanes and shoulders of the roadway. When we arrived, the cab of the semi was consumed with flames, and everything around it was beginning to burn as well. Radiant heat from the flames penetrated the windows of the rescue truck as we drove through the carnage to take up a safe position to fight fire on the other end of the scene. With a fire truck on each end and four firefighters, we were able to cool the brush fire and keep it from spreading to the power pole and nearby slope. In addition, we used firefighting foam, water, and hand tools to attack the burning semi and reduce the fire’s intensity until more resources arrived. Ultimately, firefighters, engines, and water tenders from Hot Sulphur Springs and Granby Fire, as well as additional members of Kremmling Fire, responded to help fully extinguish the fire by about 5:00 pm. All told, at least 23 firefighters from three agencies dedicated their time, energy, and skills to put out the fire, clean up the accident scene, and return all of our equipment to a ready state. Notwithstanding the tragic loss of life, this incident had the potential to cause much more damage and harm than it did. A catastrophic midweek crash is just one of many examples in our county this summer where trouble was nipped before it blossomed. I am grateful to all the first responders who work tirelessly to prevent loss of life and property, but special recognition is due the volunteers. Folks like Annie and Aron (and volunteer firefighters across Grand County) embody the volunteer spirit. They spend hundreds of evening and weekend hours training and preparing so that they are ready to take action. When you call, they come – whether they are playing, or sleeping, or working – and because they came on Wednesday, the loss was stopped. While it is important to acknowledge the volunteers themselves, this story also has a group of hidden heroes – local employers. Employers in Kremmling that have organized in a way that allows employees the option to respond to emergencies during working hours are making an enormous contribution to our community. Case in point, Hester’s Log and Lumber (where Aron works) and the Bureau of Land Management (BLM) (where Annie works) have policies in place that enable our firefighters to leave work when an urgent need arises. There are many reasons why this is a good thing. The first and most recognizable benefit of supporting emergency response during work cannot be illustrated more clearly than it was on a sunny Wednesday in May. Without the folks who can respond from their workplace, weekday response in Kremmling can be dangerously short on personnel, which puts first responders and the public at greater risk. Simply stated, businesses that allow volunteer firefighters the flexibility to respond are reducing risk for police, EMS, fire, and everyone in Grand County. No kidding. That is awesome! If preserving life and property isn’t enough, these service-minded employers are saving you (yes, you) money when volunteers can leave work to fight fire or handle a car crash. The National Volunteer Fire Council (NVFC. org) estimates that more than 800,000 volunteer firefighters across the nation save local communities more than $46 billion annually. Let me bring this statistic a little closer to home. By a conservative estimate, replacing the volunteer firefighting company in Kremmling with shifts of paid firefighters would cost roughly $650,000 per year. In order to accommodate these costs, business and property taxes for the fire district would increase by approximately 140% (more than double). For example, based on the 2018 Grand County property valuation, a commercial property valued at $300,000 would pay about $1,950 annually, and a private residence valued at $200,000 would pay about $320 annually. In addition to saving the community the cost of wages for paid firefighters, supporting volunteers helps maintain minimum staffing requirements for emergency response, which, in turn, keeps commercial and residential insurance rates from rising. In consideration of reducing risk, as well as saving money, supporting volunteer firefighters in the workforce is an essential part of a safe and prosperous town. While allowing firefighters to respond during work requires time and effort to make a plan that works for everyone, it pays dividends. Moreover, the investment that organizations like Hester’s and BLM are making in safety, in people, and in our community cannot be overstated. On behalf of first responders everywhere, thank you, volunteers, and thank you, employers, who support a thriving volunteer culture in Kremmling. Finally, I encourage all Kremmling business owners who do not support our volunteer response to take note. Please help keep our citizens and property safe and keep the cost of living in a small town affordable – allow volunteers the flexibility to respond to Everyone benefits.